Looking into the real homes of Dubai gives us a glimpse into some of the most stylish interior design projects we’ve ever seen –after all, Dubai means luxury! That’s why we’re giving ewmoda readers the chance to take a sneak peek inside some of Dubai’s fabulous homes, which are full of style tips and décor inspiration. In this ‘Featured Homes’ edit we preview a Jumeirah Islands property that has been given a stunning overhaul by New Evolution. 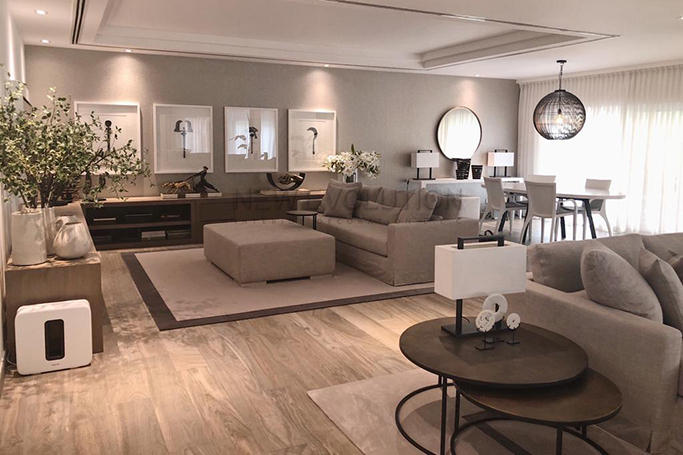 As one of Dubai’s best villa interior design services, New Evolution were behind this property’s sophisticated refurbishment, customised furniture and landscaping. From the creative design to the high quality finish, each aspect of this home has been carefully selected and created by New Evolution. So if you’re stuck on how to decorate your empty white walls or fill the abundance of space in your villa, take some tips from this chic refurbishment and inquire more at New Evolution. This dining area considers space and shape, with its feature light hanging, sphere mirror and elongated sideboard. The oval table is sleek and sophisticated, whilst the colours of the space are subtle, soft and warm, despite the monochrome shades. The living area compliments the home’s neutral palette, as earthy tones and grey hues are used to create a stylish, yet minimalist look. The details are added not with colour, but with design; from statement wall hangings to various plants and ornaments, this home is full of intricate details to admire. We particularly love the woven baskets and the assortment of unique coffee tables. From the marble top island to the stylish sliding doors, this dreamy kitchen looks too good to cook in! For more creative kitchen designs by New Evolution, click here. Follow New Evolution on Facebook and Instagram for more interior design inspiration.